Next week sees the annual London International Wine Fair taking place at London Olympia. Featuring over 14,000 wines from 40 countries around the world, this event is THE wine event for industry professionals with masterclasses, tastings, demonstrations and a host of other exciting and innovative sessions to enjoy. Without doubt, the IWF London is regarded as being one of the world’s most important wine trade events. 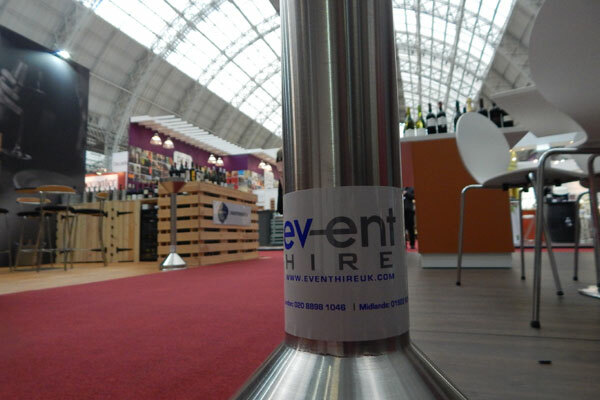 As the official supplier to the International Wine Fair London, Event Hire UK supplies almost everything required for the successful operation of the show, excluding the wine of course! ISO wine tasting glasses – the recognised industry standard for wine tasting – are supplied in abundance, with over 50,000 delivered onto site, along with a range of different spittoons which allow people to taste the wines but not consume them. After all, many people are there for the full day in a professional capacity! We even supply smaller items for wine tasting events such as bottle stoppers, flow pourers, ice buckets, wine buckets and even the glass washing machines to ensure that all the exhibitors have fresh ISO glasses for the duration of this wonderful 3 day event. As you can see, Event Hire UK offers the complete range of wine tasting equipment hire for huge wine tasting events such as the London International Wine Fair but also for smaller wine tasting events. You might be part of a wine circle and want to introduce some new regional wines to your members, or a corporate event planner wanting to lay on a wine tasting event for your clients. Whatever your event, large or small, rest assured that Event Hire UK will be able to assist with all your wine tasting event requirements. Don’t hesitate in contacting one of our expert sales team today who will be delighted to assist you.